Doc is a weathered, wily, but infinitely likable storyteller/performer. 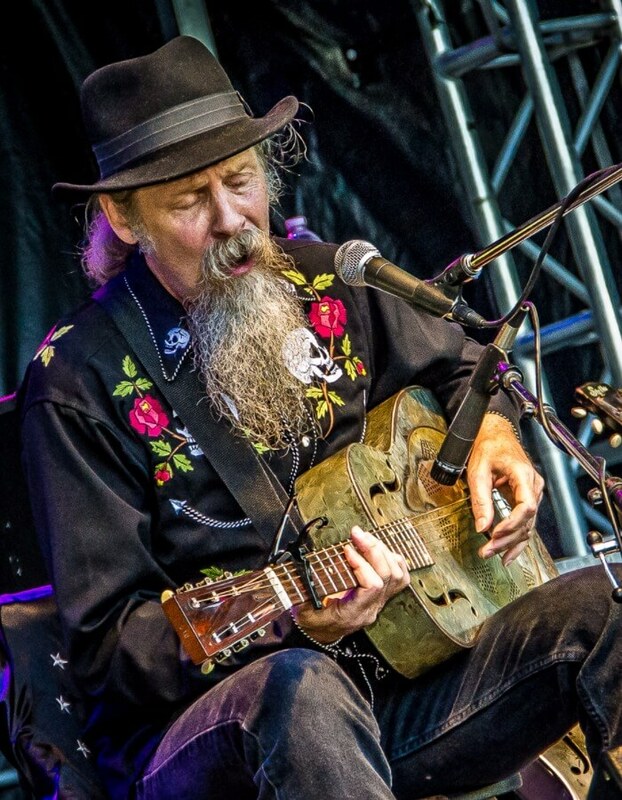 Writing from the dark side of the blues highway, Doc’s distinctive vocals and bare fingers National guitar plot an intense, emotional remapping of contemporary Delta blues and roots music. Son of a civil rights lawyer and a fiddle player, MacLean was by his early teens playing harmonica and washboard in coffeehouses and festivals, and was appearing on radio and television variety shows. In 1972 he formed a duo with Colin Linden, (now Grammy nominated producer and recent Dylan guitarist) and became a frequent opener for Sonny Terry & Brownie McGee, Muddy Waters, and John Hammond. Famously, they traded a guitar for a 1948 Dodge, and set out to explore America– never looking back. In his early travels Doc met and became friends with many older musicians including Son House, Tampa Red, and Robert Pete Williams. “Who I am, what I do and what I carry, was gifted to me by the grandchildren of slaves,” says MacLean. “I’m a small link in a big, unbroken chain.” Youthful work as an accompanist included tours and performances with Peg Leg Sam the Medicine Show Man, Blind John Davis, Sunnyland Slim, Rev Pearly Brown, and Sam Chatmon. Recordings from this period were released on Chicago’s Flying Fish label. By 2006 Doc MacLean had settled permanently in Canada, releasing the critically acclaimed CD, Narrow House. Produced by Colin Linden, the recording featured bassist Larry Taylor (Canned Heat) and drummer Stephen Hodges (Mavis Staples), who at that time were the core of the Tom Waits band. Driven by MacLean’s distinctive vocals and bare fingers National guitar, Narrow House plotted an emotional remapping of contemporary, Delta rooted music. “Angola Prison Rodeo,” has since been covered by bands around the world. During the last decade, MacLean has performed 200+ road dates each year– his annual National Steel Blues Tour typically playing in all parts of all ten Canadian provinces, two territories and 25 US states. In the process, the Tour itself became legendary. Ice roads to the arctic. Crazy, burning highways through the desert wilds. Hard travel, wrecks, and tough North American weather. And now, way over 1000 shows later, the Tour is reaching Africa. “No venue too large, too small, too grand or too humble.” Even places lost in the folds of the map. The thing that has been carried is returned. Appearing most often as a solo performer, Doc likes to say that he “tells songs and sings stories.” Indeed, in recent years his storytelling has become a unique and popular part of his performances. Forty-five years ago Doc was playing Charlie Patton songs in Son House’s living room. And he’s had a few adventures since then. Today he’s a blues vagabond, a traveler, his mostly resophonic, finger style slide guitar paying sonic homage to Patton, House and Big Joe Williams, his Lincoln more of a small home than a big car, his songs a celebration of a life lived fast and large on the Blues Highway. PreviousPrevious post:Ben Dey & The Concrete LionsNextNext post:Plug Music Agency Add Pelagic Records to our roster.